CASH-strapped Gold Coast schoolies are giving non-school leavers access to official events by illegally selling their wristbands on social media. Official wristbands provide access to the Schoolies Hub on the beach at Surfers Paradise and can only be obtained by showing school identification. The Courier-Mail can reveal wristbands are being bought and sold online for up to $100 each. Schoolies wristbands are being sold on Facebook. 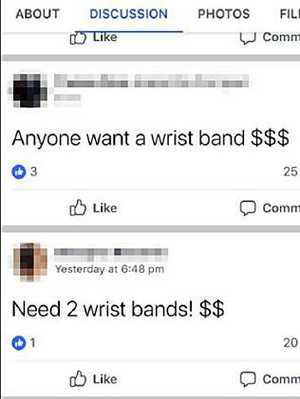 A 17-year-old girl from Brisbane, who did not wish to be named, said several members of her leavers group had loosened their wristbands and sold them to non-Schoolies for profit. "They plan to just go line up and get another band with their school ID. 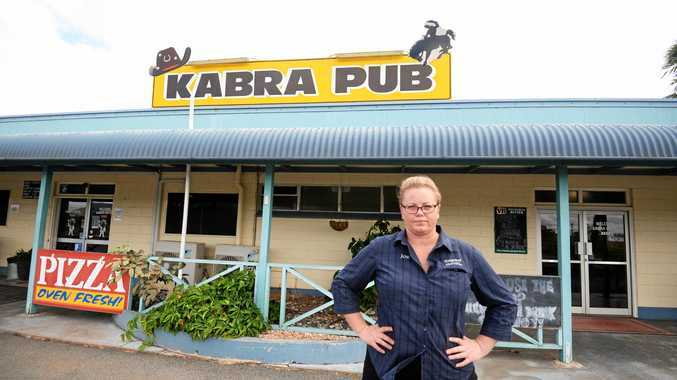 "I think the people doing it are really just out for a bit of cash but you have to wonder why a non-schoolie would even want to get into the hub in the first place," she said. The official Schoolies Hub is an alcohol-free zone, however a large number of empty alcohol containers were left strewn along the beach in the early hours of Sunday morning. Schoolies organisers said the purpose of the wristband is to identify the teens as legitimate 2017 school leavers and were effectively tamper proof. A spokesman said security guards at the entrance of the Schoolies Hub are trained to detect wristbands that have been tampered with in any way and would eject anyone breaking the rules. Organisers said they were "very happy" with the behaviour of the majority of attendees on the opening night of Schoolies. Queensland police arrested six schoolies, mostly for drug-related offences, on Saturday night. A QAS spokesman said the number of people treated was comparable to previous years, with the majority of cases including intoxication or mild injuries from trips, sprains and strains. "No cases were reported as a result of assault, which is extremely positive to see," he said. The spokesman confirmed paramedics were called to attend the Crown Towers hotel in Surfers Paradise after about 28 people were reportedly trapped in a lift for an hour at about 8pm on Saturday. "One person was treated on the scene for anxiety," he said. On the same night at a another hotel in the Schoolies precinct 28 people were trapped in a lift for about an hour. "Paramedics attended to about six people, one had a history of asthma which obviously exacerbated their condition. "All were treated for heat stress and anxiety, they were trapped for about an hour so you can imagine that body temperature can increase. "They were all released fit and well," he said. It comes as parents of a Brisbane teenager who was stabbed in the neck in an unprovoked attack on Saturday morning thought they had lost their son. Alphaeus Garos, 17, was standing outside a licensed venue on Mains Rd in Sunnybank Hills on Saturday morning when he was approached by a 33-year-old man. After a very brief conversation the man, who is unknown to the teen, stabbed him in the neck. Mr Garos was taken to the Princess Alexandra Hospital in a serious condition and has since undergone emergency surgery for a punctured lung. He may remain in hospital for at least two weeks according to media reports. His mother Athena told Channel Nine she was "living a nightmare". "In all honesty, I thought I lost my son," she said. "It was the worst thing a parent can go through. I thought I was living a nightmare." Father Michael Garos said he has many questions about the man who stabbed his son, and why the 33-year-old was out on the streets if he allegedly had mental health flags against his name. The Department of Health is reportedly looking into the case and Metro South hospital is said to have had the man as a patient previously. The 33-year-old will face Brisbane Magistrates Court today. Scattered showers and cold sea breezes had a cooling effect on the celebrations, with many schoolies abandoning the Surfers Paradise precinct before midnight on the weekend. A brief downpour about 11.30pm sent most of the teens back to their hotel rooms where they remained for the night. Schoolie Paige Harvey, 17, from Rockhampton, said her first night was much quieter than expected due to the weather. "The one time it rains and it has to be during a Schoolies week, it's sad but nothing you can do about it so we're trying to not let it ruin everything," she said. Fellow high school graduate Emma Donovan, 17, said the pair had prepared for the worse as more rain is expected to reach the coast today. "We bought ponchos and umbrellas after we got wet the first time and it seems we will be needing them more than once this week," she said.